The OWHC is an organisation focused on providing the spiritual, social, educational, cultural and welfare needs of the large Hindu community living in and around the Borough of Oadby & Wigston, Leicestershire. Email: info@hindu-community-oadby-wigston.org or contact: Vinodbhai Ghadiali - 07506 705029 for further details. 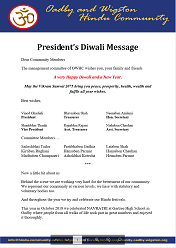 Email: info@hindu-community-oadby-wigston.org or contact: Shantilal Thanki â€“ 07503 160250 | Vinodbhai Ghadiali â€“ 0116 2414529 for further details. Email: info@hindu-community-oadby-wigston.org or contact: Sailesh Tailor on 0777 9161907 for further details. Navaratri (nine nights) is one of the greatest Hindu festivals. It symbolises the triumph of good over evil. Navratri takes place at the beginning of October around harvest time and, as the name implies, this festival is celebrated for nine days. Navratri is also known as Durga Puja. During this period, Durga, Lakshmi and Saraswati are worshipped as three different manifestations of Shakti, or cosmic energy. Navaratri is celebrated by communities getting together for dances and nightly feasts. To celebrate a good harvest and to propitiate the nine planets, women also plant nine different kinds of food grain seeds in small containers during these nine days and then offer the young saplings to the goddess. Diwali is an important festival in Hinduism, Jainism, and Sikhism, celebrated for different reasons, occurring between mid-October and mid-November. For Hindus, Diwali commemorates the return of Lord Rama, along with Sita and Lakshmana, from his 14-year-long exile and vanquishing the demon-king Ravana. In joyous celebration of the return of their king, the people of Ayodhya illuminated the kingdom with earthen diyas and burst firecrackers. For Jains, Diwali marks the attainment of moksha or nirvana by Mahavira in 527 BC. For Sikhs, Diwali is important because it celebrates the release from prison of the sixth guru, Guru Hargobind, who also rescued 52 Hindu kings held captive by Mughal Emperor with him in the Gwalior Fort in 1619. The name "Diwali" is a contraction of "Deepavali" which translates into "row of lamps". Diwali involves the lighting of small clay lamps filled with oil to signify the triumph of good over evil. During Diwali, all the celebrants wear new clothes and share sweets and snacks with family members and friends. (Source: Wikipedia). The Indus Valley Civilization (IVC) was a Bronze Age civilization (3300â€“1300 BCE; mature period 2600â€“1900 BCE) that was located in the northwestern region of the Indian Subcontinent. Geographically, the civilization was spread over an area of some 1,260,000 km², making it the largest ancient civilization in the world. The Indus Valley is one of the world's earliest urban civilizations, along with its contemporaries, Mesopotamia and Ancient Egypt. Inhabitants of the ancient Indus river valley, developed new techniques in metallurgy and handicraft, and produced copper, bronze, lead, and tin. The civilization is noted for its cities built of brick, roadside drainage system, and multistoried houses. A sophisticated and technologically advanced urban culture is evident in the Indus Valley Civilization making them the first urban centers in the region. The quality of municipal town planning suggests the knowledge of urban planning and efficient municipal government. As seen in Harappa and Mohenjo-daro, this urban plan included the world's first known urban sanitation systems. (Source: Wikipedia).